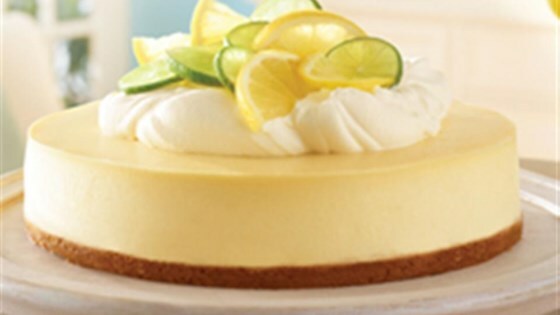 "Fresh lemon and lime zest and juice flavour a classic cheesecake with a graham crust." BAKE 35 to 40 minutes or until center is almost set. Run knife around rim of pan to loosen cake; cool before removing rim. Refrigerate cheesecake 4 hours. Soooooo good! It definitely helps if you have ripe lemons and limes. I made it last weekend and it tested good enough to be the main dessert for Easter. Make it! It's so good! I have made this twice. Taste so good! I did a raspberry sauce on the top! Such a hit with my dinner quest. Loved everything about this recipe. I wouldn't change anything about it. Made it for my brother's birthday and he loved! This was a rich yet very light cheesecake. Tasty and not overly sweet! Just right!